These ain't your granddaddy's Magic puzzles. You not only have to consider the board, you have to consider every card that's ever been printed. 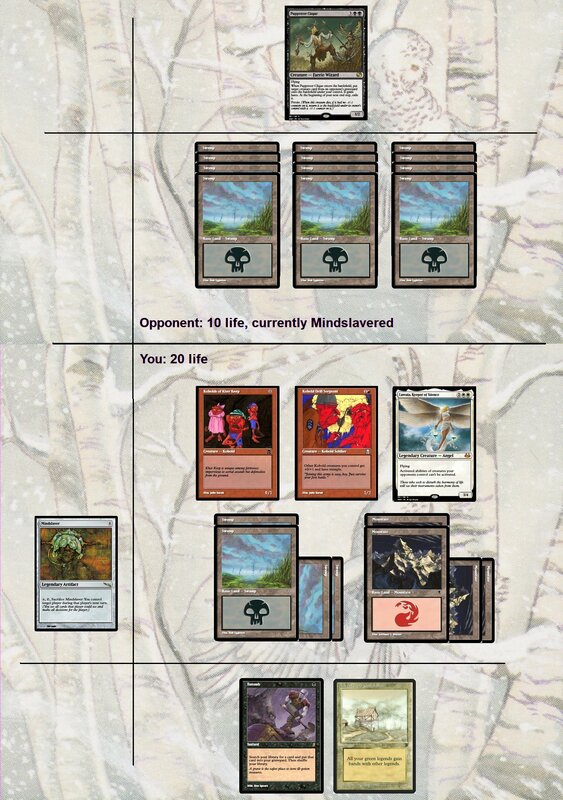 That's because, with these puzzles, your deck contains four of every Vintage-legal Magic card. Your tutor can get anything!!! The solutions are therefore more about trivia than strategy. Try your best! And using Scryfall's Advanced Search is not cheating—I used it myself when making these puzzles. We'll start with an easy one as a warm-up. You tap your only three Islands for a Fabricate , leaving only a Mishra's Workshop untapped. 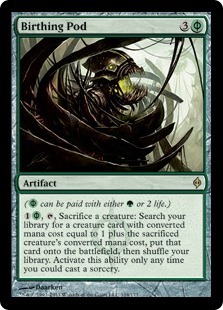 What artifact can you fetch that wins you the game upon casting? 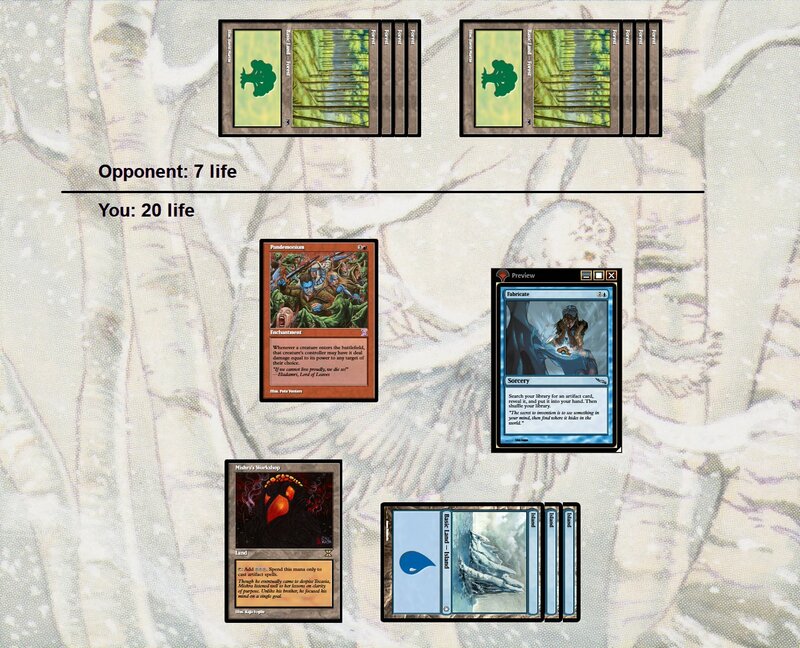 The board is empty on both sides other than your Pandemonium , and your opponent is at 7 life. In case you skipped this article's preamble, your deck contains four of every Vintage-legal Magic card. Your opponent cackles with glee. "Not even your Scion of the Ur-Dragon can save you now!" 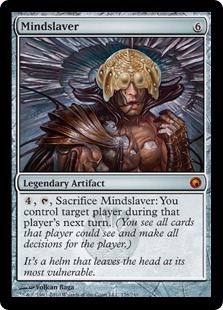 And it certainly seems that way: this opponent is at 2,000 life, has 2,000 cards left in their library, and is even protected by an Ivory Mask and Privileged Position ! Fortunately, you have a Demonic Tutor and, with three of each basic land in play, enough mana to cast almost anything you get. You'll even have mana left over to activate the Scion if needed. You have way more options than the first puzzle—but with four of every Vintage-legal Magic card in your deck, you're sure one of them can guarantee victory this turn. What is it? If those first three puzzles were too easy for you—good news! Instead of starting with a 2cmc creature, you start with a 5cmc creature (let's say, uh, Orgg ). In addition to the four Birthing Pod s, you also have 3 Voltaic Key s, giving you seven total Pod activations. You have more land to cover all of this. How does 5 of each basic sound? 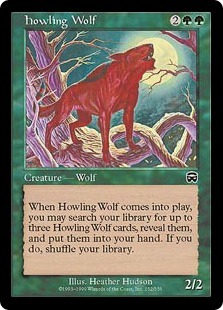 You have Time of Need in hand, and when your deck has 4 of every vintage-legal card, that gives you a lot of options. 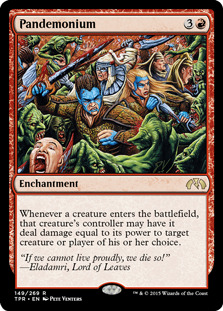 But even that doesn't seem to be enough, since your opponent is at 40 life and assures you they can win next turn. Other than tapped lands, their board is empty—but how can you possibly deal 40 damage this turn with only one card and 35 mana? You are about to concede until Cotton Rhetoric assures you that there really is an out, if you think carefully. Due to the nature of these puzzles, there are likely to be alternate solutions I did not think of! Please share them in the comments if you find any. 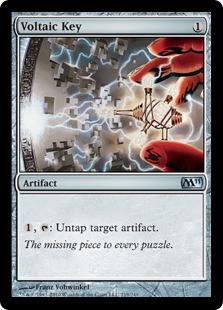 Hint #1: You can solve this puzzle without activating Scion of the Ur-Dragon . Highlight the black bar for another hint. 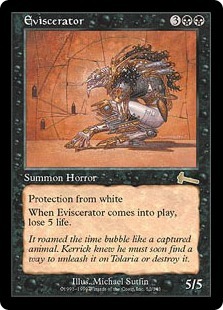 Hint #2: I couldn't think of a way to deal 2,000 damage or mill 2,000 cards. Maybe there's some other approach? 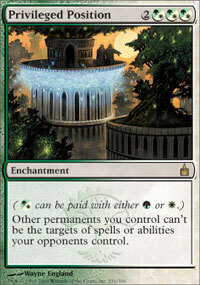 Hint #3: I said you don't have to ACTIVATE Scion. It does still matter toward the solution, though. Solution: Scion is a creature of all 5 colors. 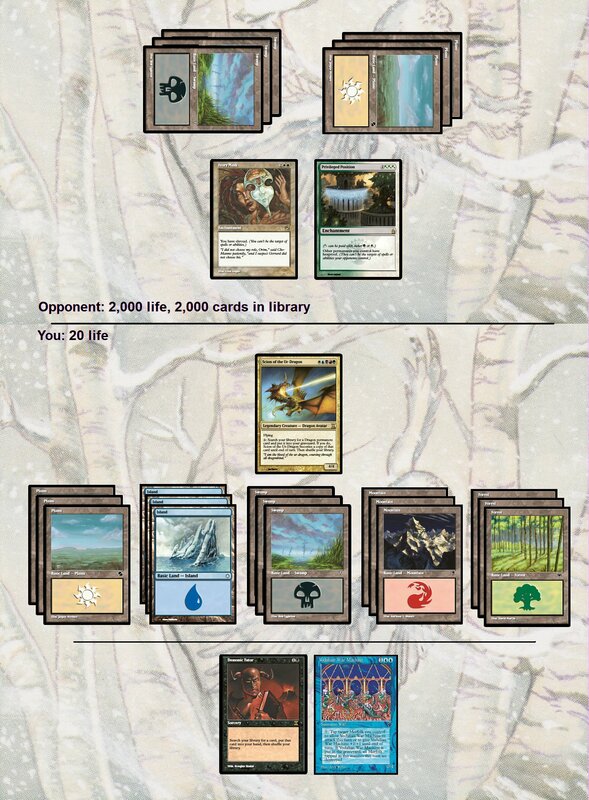 You have all 5 basic land types in play. Just grab a Coalition Victory and use that to win! Solution: Phage the Untouchable isn't just a years-old forum punchline, it's also the solution to this puzzle. 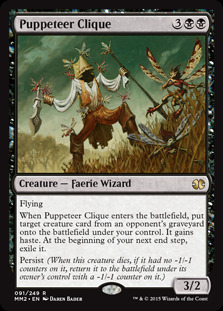 Put it into your graveyard with Entomb , force your opponent to cast their Puppeteer Clique and put your Phage onto their battlefield, triggering its first ability and causing them to lose the game. Hint #1: The best solution I could think of does use all 4 Pods. Make a checklist of what you need to accomplish, then figure out what each Pod can fetch to check off that list. 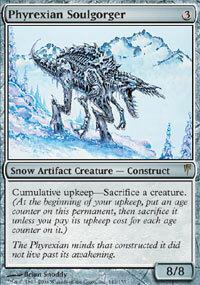 Hint #2: The trickiest part of this puzzle might be that you can only have one creature in play at a time. Can you find creatures that work around that restriction? 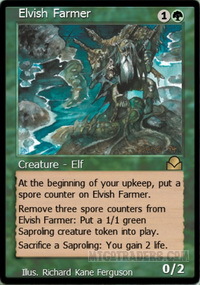 First Pod: change the 2cmc Elvish Farmer into the 3cmc Reclamation Sage (or something similar) to kill the Platinum Angel . Second Pod: change the 3cmc Reclamation Sage into the 4cmc Anger. 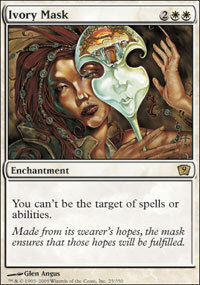 Third Pod: change the 4cmc Anger into the 5cmc Master of Cruelties. > Note that this puts your Anger into the graveyard, giving Master haste. It attacks and reduces the opponent's life to 1. 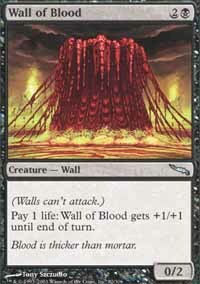 Fourth Pod: change the 5cmc Master into any 6-mana creature that deals immediate damage, for instance Inferno Titan. Hint #1: At higher CMCs, there are fewer options, and they often have quirky packages. Parse what options you do have and I'm sure you can find cards that do what you need them to. Hint #2: My solution uses all 7 Pods, and if you calculate what CMC that ends up at, this was a large hint indeed. 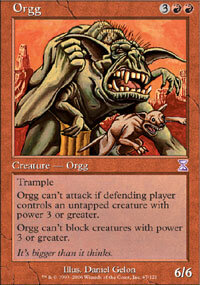 First Pod: change the 5cmc Orgg into the 6cmc Cyclops of Eternal Fury. 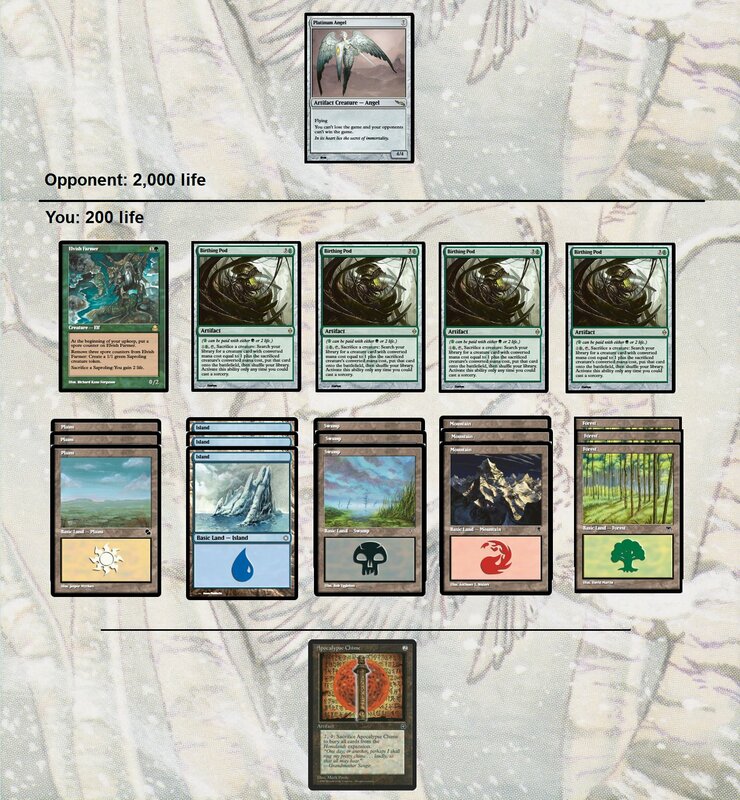 Second Pod: change the 6cmc Cyclops into the 7cmc Angel of Serenity, exiling the Cyclops that is now in your graveyard. 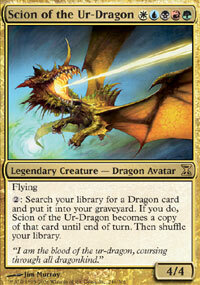 Third Pod: change the 7cmc Angel into the 8cmc Ashen Rider. 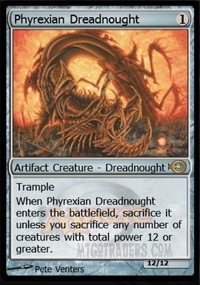 > This returns the Cyclops to your hand in addition to exiling the opposing Platinum Angel . Hardcast the Cyclops. Fourth Pod: get basically any 9cmc creature. Fifth Pod: get basically any 10cmc creature. Sixth Pod: get basically any 11cmc creature. Seventh Pod: get Blightsteel Colossus, attack with haste for the win. Hint #1: Boy, this one is hard. It really is possible though, and without milling, poison counters, or an alternate win condition. You can deal 40 damage this turn off your one tutor. Hint #2: 35 mana and 40 life sounds really precise. What could cost exactly that much and deal exactly that much? 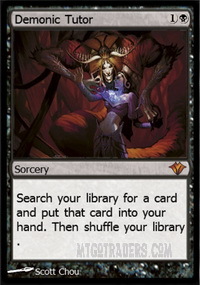 Hint #4: Your only card is a tutor, but maybe there's something you can do in addition to tutoring? 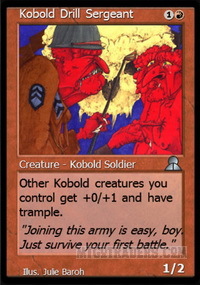 Hint #5: Wasn't there some weird rules-bending card in Coldsnap? 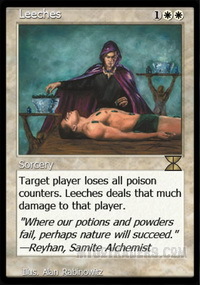 Solution: Panglacial Wurm! Remember that one? For 7 mana each, you can cast them while searching your library for something else. Use 2 mana to cast the tutor, 28 more for all four Wurms, and the remaining 5 for a legendary creature capable of giving them all haste, like Urabrask the Hidden. 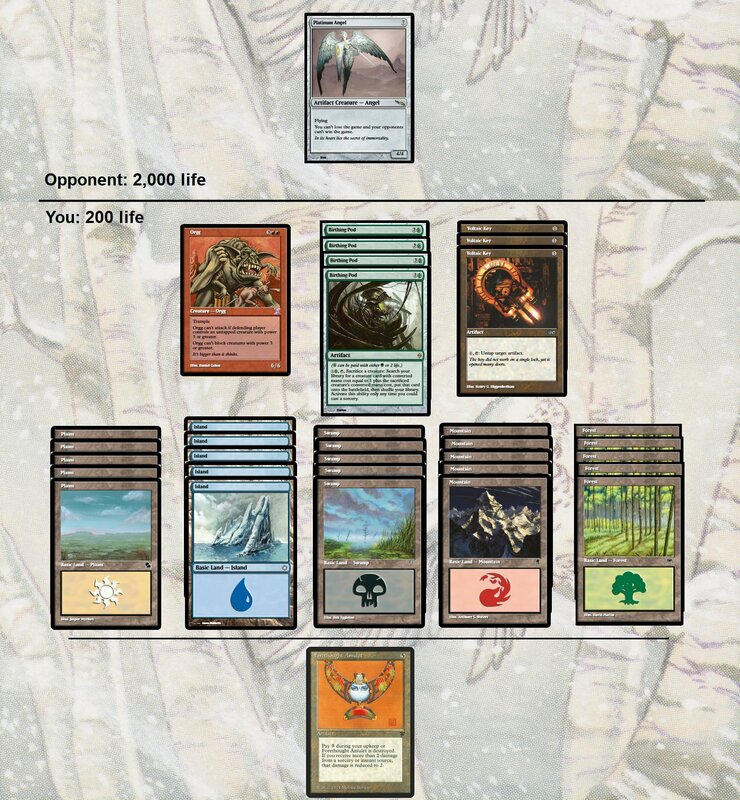 His 4 power plus the wurms' 36 totals 40 damage. Thanks, and hope you enjoyed! Good catch! 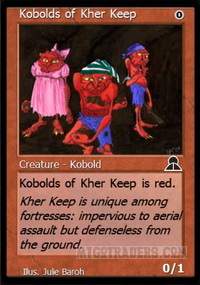 I am definitely more familiar with quirky old cards than viable tournament strategies. - In Puzzle #2, the Scion can become a Skithiryx, the Blight Dragon, and the Demonic Tutor can get any number of pump spells. 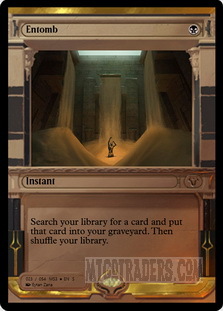 - Puzzle #3 can be solved with Minion of the Wastes.